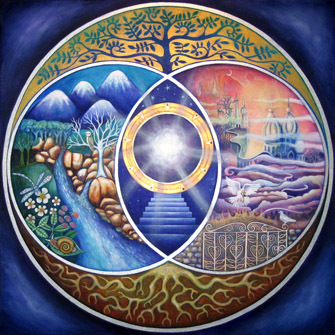 Think of Two Worlds as a bridge between worlds—touching on one side into the roots of ancient perennial wisdom while simultaneously reaching on the other side into the future. Imagine it as a convergence between spiritual and scientific spheres. See it as both an intuitive and analytic path you travel with others at the evolutionary edge of our culture. At the heart of Two Worlds is the idea that there is power and possibility in new intersections—in the integration of that which seems opposed—in the translation and application of wisdom from one world into another world. Wisdom exists in all places and times. There are ageless concepts that represent the highest understandings of people, many of which are deeply familiar. Yet most of this wisdom is noticeably absent in business, politics, economics, education, health, and other spheres. Many of the problems we face can be traced to the way in which we have separated our highest wisdom from our approaches to leading and living. Our purpose for Two Worlds Wisdom School is bridging our wisdom to the ways we live and lead. We have gleaned 108 wisdom principles from the world’s great wisdom traditions. These serve as the seed ideas around which everything revolves.